Working / Clean Pull. Part Number - SL16D316R11D4HA. 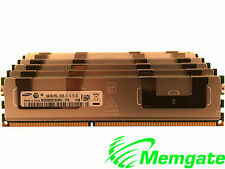 Type: 240 -Pin DDR3 DIMM. Speed: DDR3 1333 MHz (PC3-10600R). Capacity: 4GB. New Arrival. for our request andwe hope you can understand ! So if you have any. We will response in 24 hours to resolve the problems. Size 24GB (6X4GB). HP WORKSTATION Z800 AND Z600 C2 REVISION ONLY. THIS WILL NOT WORK WITH THE B3 REVISION OF THE Z600. These are designed to work in the models listed below. It takes between 5 or 15 minutes. Lot of (6) 16GB ECC Server Sticks. 16gb 2Rx4 PC3-12800R. Clean / Tested Pulls. Size 24GB (6X4GB). DELL PRECISION WORKSTATION T5500, T7500. These are designed to work in the models listed below. Type DDR3 ECC REG. It takes between 5 or 15 minutes. And, it's one of the easiest ways to make your computer run faster. Compatible with HP PROLIANT DL380 G7 DL980 G7 ML330 G6 ML350 G6 ML370 G6. Condition New, Tested, 100% working condition. Bundle Listing Yes Model CMD12GX3M6A1600C8 Number of Pins 240 Number of Modules 6 Capacity per Module 2GB Type DDR3 SDRAM MPN Does Not Apply Bus Speed PC3-12800 (DDR3-1600) Brand Corsair Form Factor DIMM Total Capacity 12 GB UPC Does not apply. It takes between 5 or 15 minutes. And, it's one of the easiest ways to make your computer run faster. Compatibility HP Proliant BL680C DL165 DL360 DL380 DL385 DL580 G7. Every A-Tech ram module is tested for complete functionality before it leaves our doors. Give your computer the best, trust A-Tech! 12 Total Pieces, verified to work as a set in compatible motherboards. 16gb 2Rx4 PC3L-10600R. Clean / Tested Pulls. HP P/N: 500205-071. Tested extensively and works PERFECTLY! Compatibility DELL POWEREDGE R320 R420 R520 R610 R620 R710 R820. Condition These are all New Condition modules with original HP or Dell labels. Every A-Tech ram module is tested for complete functionality before it leaves our doors. 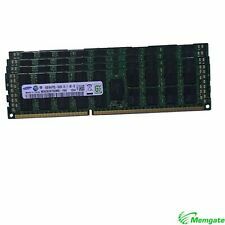 You are buying (1) Micron 4GB (6X4GB) 24GB MT18KSF51272PZ 1Rx4 PC3L-10600R FRU: 49Y1424 DDR3 Server Ram. These sticks were pulled from working retired servers. See pictures for details. Hours of operation: M-F 8:00AM-4:30PM. Compatibility DELL POWEREDGE C2100 C6100 M610 M710 R410 M420 R515. Condition These are all New Condition modules with original HP or Dell labels. Every A-Tech ram module is tested for complete functionality before it leaves our doors. Compatibility DELL PRECISION WORKSTATION T5500 T5600 T7500 T7600. Every A-Tech ram module is tested for complete functionality before it leaves our doors. Give your computer the best, trust A-Tech! All of the components in our modules are sourced from the top manufacturers and only utilize new and new condition components. Compatibility DELL POWEREDGE M520 M620 M610x M820 M915 R415 C6220. Condition These are all New Condition modules with original HP or Dell labels. Every A-Tech ram module is tested for complete functionality before it leaves our doors. Timings: CL9. Buffering/Ecc: ECC Unbuffered. 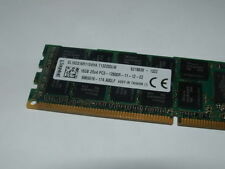 Type:240 -Pin DDR3 DIMM. Speed: DDR3 1333 MHz (PC3-10600E). CPU Processor. Manufacture by Samsung,high quality item. for our request andwe hope you can understand ! · Type: 240-Pin DDR3 Dimm. · Speed: PC3-10600R 1333MHz. We will try our best to solve any problems. Ruturn Policy. Compatibility HP Proliant DL320 DL360 DL370 DL380 ML330 ML350 G6. Every A-Tech ram module is tested for complete functionality before it leaves our doors. Give your computer the best, trust A-Tech! Condition These are all New Condition modules with original HP or Dell labels. RAM only for Z600 Rev C2. Will Not work with Rev B3. Compatibility HP Proliant ML350E ML350P SL210T SL230S SL250S G8. Every A-Tech ram module is tested for complete functionality before it leaves our doors. Give your computer the best, trust A-Tech! Condition These are all New Condition modules with original HP or Dell labels. The Hynix part number is HMT31GR7CFR4C-H9. These modules were used in a Dell PowerEdge R610 server This module set is in great shape and working perfectly. There are Eight 8GB DIMMs for a total of 64GB of RAM. Dell PowerEdge R410 R510 R520 R610 R620 R710 R715 R720 R810 R815 R910. Working / Clean Pull. Part Number - SL16D316R11D4HA. 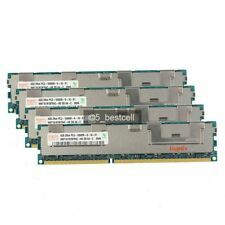 You are buying (1) Lot 3X Samsung M393B5170EH1-CH9 (2x4GB) 8 GB 2RX4 PC3-10600R Server Ram. We are always willing to help. We can wait longer if notified or we can cancel the order. 1260 E Watertower St.
8gb 2Rx4 PC3L-10600R. Clean / Tested Pulls.